As part of Latin American Week 2018, we are bringing Gustavo Castro to Cork. Stay after our Latin American Development Issues or just come along for this free talk. The speaker will talk in Spanish but we will provide an interpreter to translate Gustavo´s words into English at the event. Gustavo Castro Soto is a Mexican sociologist who has dedicated his life to the defense of the environment. 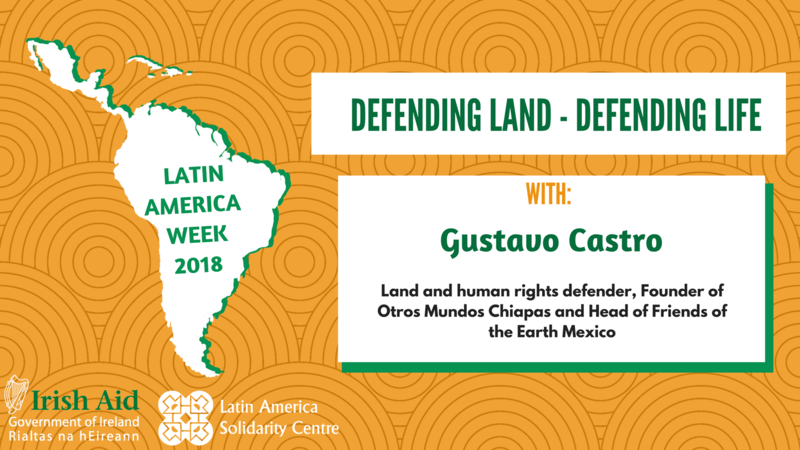 Gustavo is a founder of Otros Mundos and Head of Amigos de la Tierra (Friends of the Earth) Mexico, organisations that are seeking new formulas to protect the environment and promote a more just, equal and peaceful world. Gustavo was also a friend and long-time supporter of Berta Cáceres and the Civic Council of Popular and Indigenous Movements of Honduras (COPINH). Gustavo was the only witness to Berta’s assassination on March 2nd, 2016, having himself been shot by the gunmen and left for dead. Following the murder, Gustavo was declared a protected witness but was illegally detained in Honduras for a month under suspect legislation.